Recently, Tom Niemerow of Concrete FX, sent in this picture of a home office transformed with stained concrete. 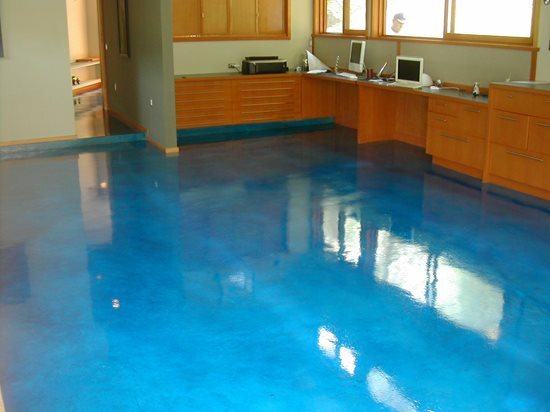 The color was created with Smith Paints' Ocean Blue dye stain. It was sealed with two coats of GST's Wet Look Acrylic Sealer. I've attached a floor we recently stained for a homeowner – his home office. We used Smith Paints Ocean blue dye stain. It was sealed with 2 coats of GST's Wet Look Acrylic Sealer and two coats of GST"s Final Coat wax.